Size of this PNG preview of this SVG file: 595 × 599 pixels. Other resolution: 238 × 240 pixels. 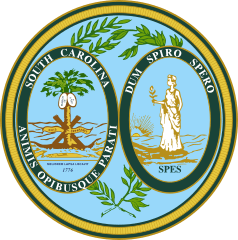 Description: The Great Seal of the State of South Carolina, USA. Credit: ATSDR (part of the CDC) series of state-specific fact sheets. Bitmap versions have been seen on US Embassy websites. Direct PDF URL . Author: Government of the United States. Permission: U.S. Government rendition; copyright is owned by the artist (not necessarily the states), which in this case is the federal government. This page was last modified on 21 July 2018, at 14:50.